However – I do give in to the masses and acknowledge that more people like, than dislike, the pumpkin spice. So I created this card for my Holiday catalogue Celebration party last week. First I cut the 2 panels of Whisper White cardstock, and layered them on top of each other. Holding them in place with one hand, I stamped the cup rings and splatters in Crumb Cake ink from the Timeless Textures stamp set. 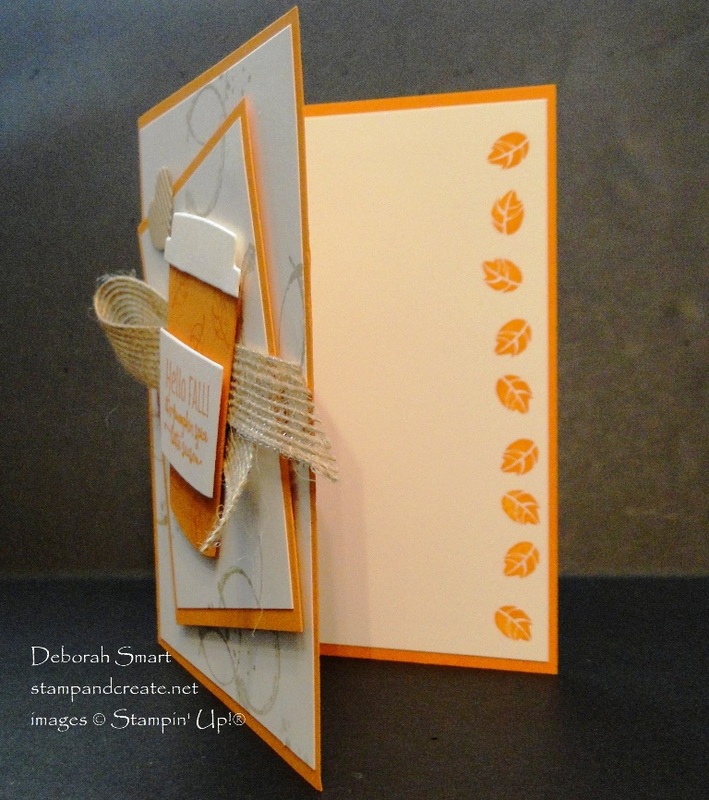 On a small piece of Whisper White, I stamped the sentiment in Pumpkin Pie ink. Then I die cut the sentiment, cup shape and lid using the Big Shot with the Coffee Cups Framelits Dies. First I layered the smaller panel of stamped Whisper White on top of a slightly larger panel of Pumpkin Pie cardstock. I then lined up the stamped cup rings on the larger Whisper White, and attached the layers together using Stampin’ Dimensionals. 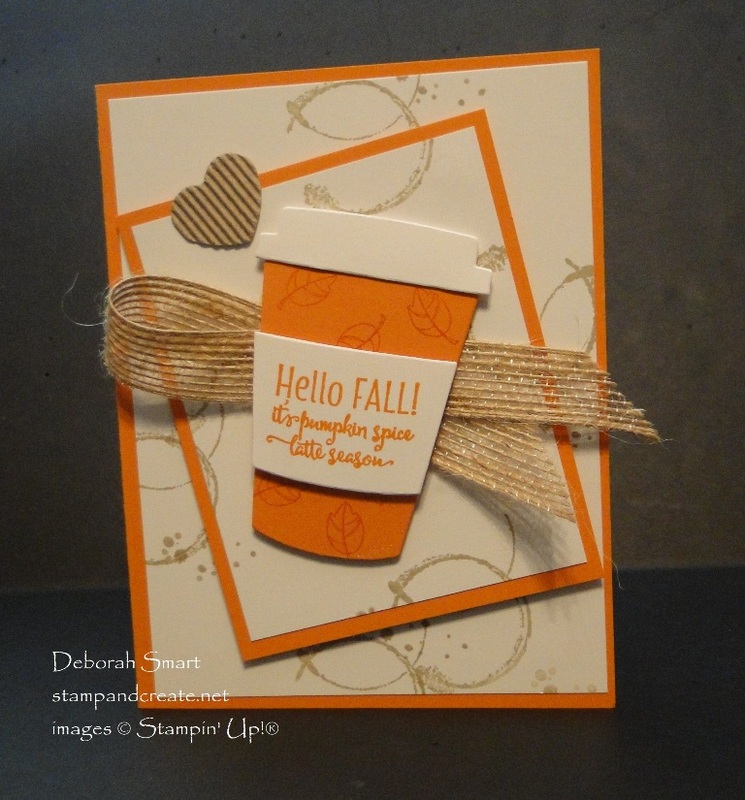 I then stamped the small leaf image in Pumpkin Pie ink onto the Pumpkin Pie cardstock cup. Once the panels were layered together, I assembled the sleeve and lid on the cup. Then I attached a looped piece of Burlap Ribbon behind the cup, and again used Dimensionals to attach it to the panel. Finishing off the card front is one of the heart shaped Corrugated Elements. I wasn’t sure who I would send this card to, or for what occasion, so I didn’t stamp a sentiment yet. I did repeat stamp the solid leaf image down the right side of the inside panel, in Pumpkin Pie ink. This card was quick & fun to make! I know I’ll get a lot of use from this Merry Cafe set, as it includes lots of great images for fall, Hallowe’en and Christmas! Paired with the Coffee Cafe Bundle, and these sets will see a LOT of use all year long! It’s easy to recreate this card – just click on the images below and you’ll be taken directly to my online store! There, you can order as many supplies as you need – and remember – when your order totals $375 or more, you automatically qualify for the FREE Merry Patterns stamp set! What a fun card! I love the pumpkin pie cup – but I agree about pumpkin spice. I do love it in pie; not so much in coffee. Great card Deb. Love it! I love pumpkin but I am one of those weird people who hates coffee! We would make a great pair. Cute card!